Kinda Has Cancer: So What Do I Have, Exactly? So What Do I Have, Exactly? I have a nine-centimetre mass in the left-to-mid side of my upper chest. It is sitting on top of my lung and pressing towards my heart. 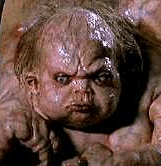 We have unaffectionatly dubbed him Kuato. Its official cancer name is an immature teratoma, which is actually a good news since they the initial diagnosis where lung cancer or lymphoma (that was a bad month). There are embryonic cells left over from when you where nothing more than a zygote. These cells are primarily found deep inside your body and for most people they’ll never cause a problem. However, every once and while, one of them decides NOW is the time to start growing, but without instructions to grow into anything specific, they become a tumour. In men my age, that usually happens in the testicles. This can start a chain reaction up the body, stirring other embryonic cells to start to grow. Some of these grow into more aggressive germ-cell tumours (this is what happened to Lance Armstrong) while others become less aggressive teratomas. I’ve been poked, scanned, shot through with sound waves and Xrays until I glow in the dark, but they can’t find a trace of anything else, yet. I’m doing chemo because all that doesn’t mean that there isn’t something lurking around deep inside somewhere, still only a few cells wide but waiting to explode. What makes me a frickin’ medical anomaly I have no sign of the more aggressive germ-cell types. So far I only have Kuato. The chances of getting a teratoma on its own are so rare that I’ve actually become something of a case study. The good news in all of this is that immature teratomas are very self contained and not likely to spread (though they can grow teeth and hair). The bad news is that given its location in my chest, I may be looking at some major surgery. Teratomas don’t respond that well to chemo, but even if they can shrink it down a little, it would help.